They’ve won the Czech Rally Championship for the fourth year in a row now, but the world title is something new for them. Jan Kopecký and his co-driver Pavel Dresler became the first Czech crew to win the WRC 2 title, and they did it driving a Czech car. 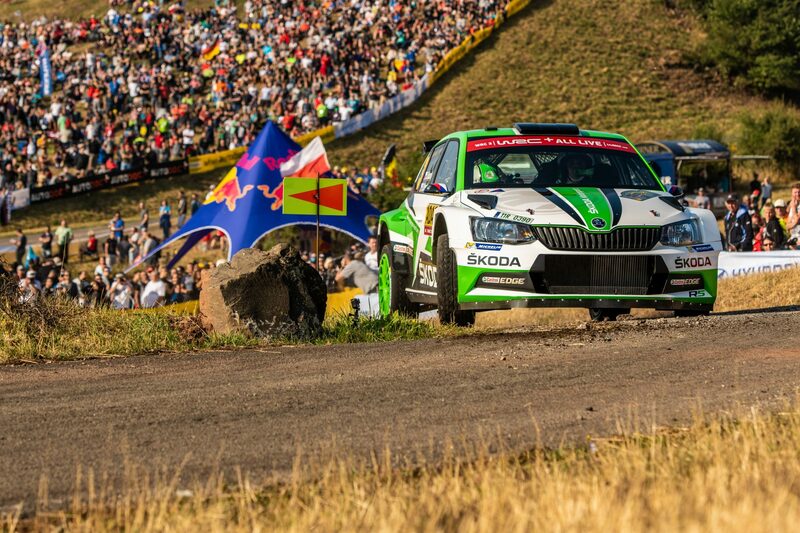 This led to them standing on the podium aboveteammates Pontus Tidemand and his co-driver Jonas Andersson, as well as ŠKODA Motorsport’s young hopeful, Kalle Rovanperä, and his navigator Jonne Halttunem. 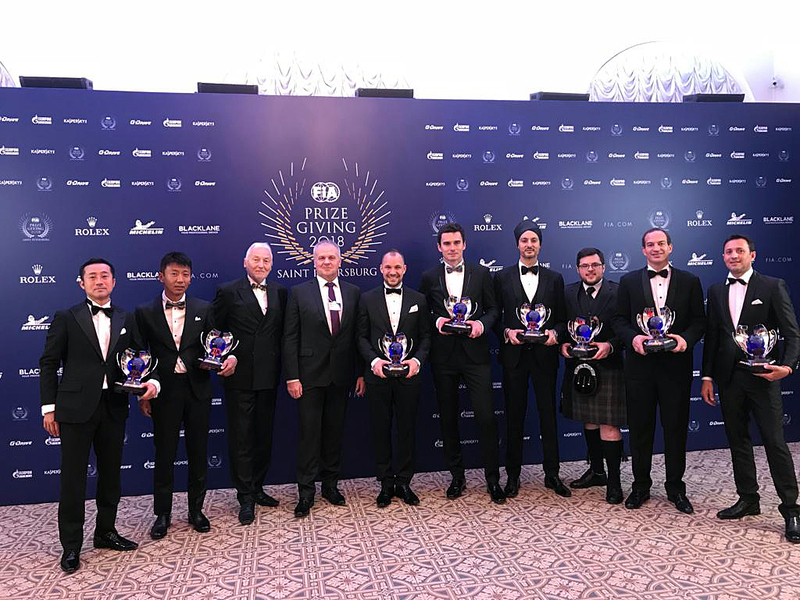 This weekend, all of them received their awards at the FIA gala night in St. Petersburg, which gave us a great opportunity to ask them about this season, the past and the future. After 17 years behind the steering wheel of a rally car, you’re finally the world champion. How does it feel? This season, we got a real chance to fight for the WRC 2 title, wheres last year, we didn’t really have a chance to go after it. 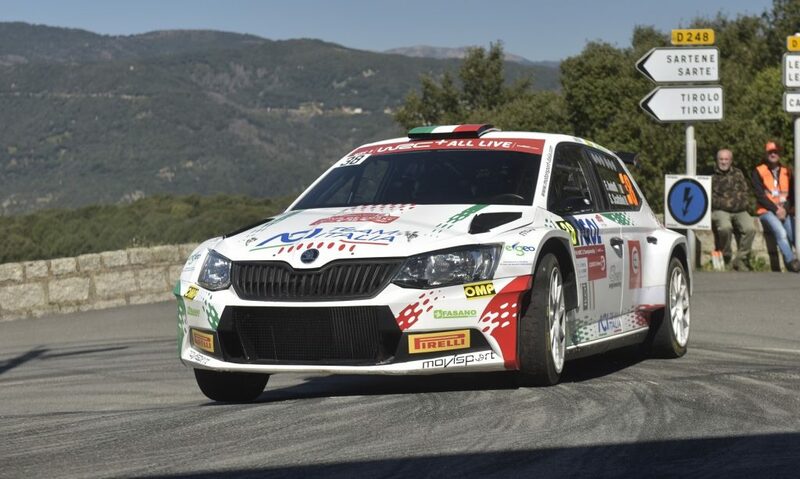 In 2015, the FABIA R5 was brand new and didn’t enter the championship until May. In the following season, some rallies didn’t go as well as we had hoped, and the tarmac rally in China, which would have been a great opportunity to score for us, was cancelled. Last year, we missed our chance due to results in Corsica and Germany. Finally, this year, everything went according to plan. 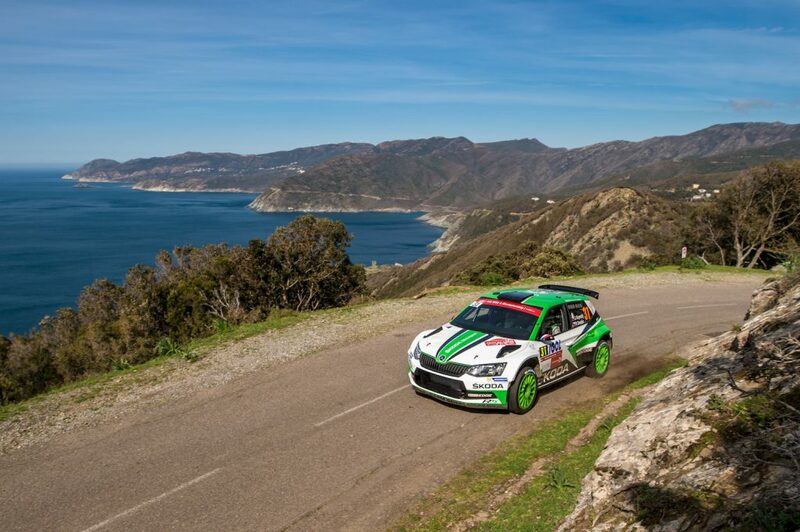 The winning streak started in Monte Carlo, followed by a victory on Corsica. That was the point when we realized we had a real chance to win. On Sardinia, our goal was to be no lower than second; we won again. This continued until Spain, where I finished runner-up to my teammate Kalle Rovanperä after we made the wrong choice of tyres and lost lots of time on the wet track. You’re 36 years old. 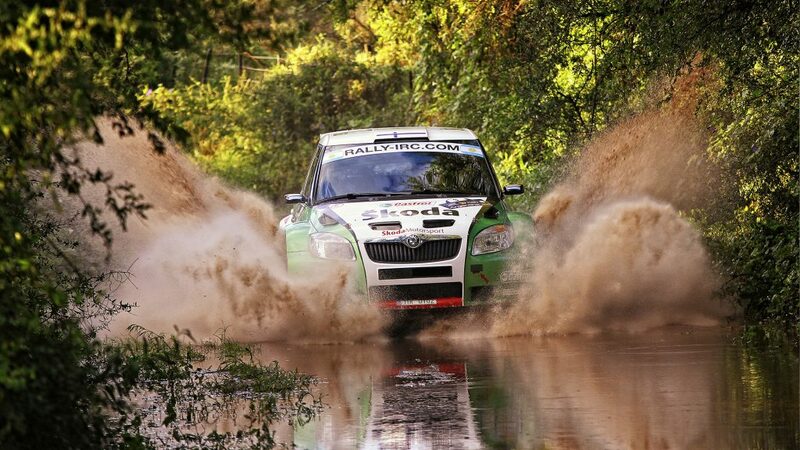 How long will you keep rallying? You can keep rallying for as long as you enjoy it and you have the right conditions. Naturally, I’m doing motorsport because I like it, but that doesn’t mean that results aren’t important to me. Once I realize I don’t have what it takes anymore, I would rather stop. I’m sure that I wouldn’t enjoy going to rallies just to take part, but I can’t guess how long I will be able to keep at it. In the Czech Rally Championship, you and Pavel have won every rally you have entered since the beginning of the 2015 season. Doesn’t it get boring sometimes? Don’t you miss bigger challenges? For us, it’s not boring. As the works team of the domestic automaker, it’s the least that’s expected of us! It would be interesting to be challenged more by our competitors, but that’s up to them. How big of an advantage does the works team have against the private ones? It’s obvious that our situations aren’t identical. Private teams don’t have the factory backing with all the possibilities that brings. What’s more, our car is quite definitely the best in its class – the results prove it! Nevertheless, the performance of drivers like Russian privateer Alexey Lukyanuk at Barum Rallye, which is an event full of the best competitors from around Europe, prove that sometimes even private teams can get close to factory ones. At Barum Rally, you competed against Dani Sordó, who drove a Hyundai i20 R5, though he normally drives the Korean brand’s WRC car. Did you expect to have to fight for the victory, or did you think that he would lack experience with the slower car? I think his biggest handicap really was the fact that he didn’t know the car that well, and didn’t have the experience we have with the FABIA R5. He certainly did some training runs before the rally, but apparently that wasn’t enough. I have to add that the weather conditions made it one of the hardest years at the Barum Rally that I’ve ever experienced. So, all things considered, he performed pretty well. Talking about competitor cars, what do you think about the Volkswagen Polo R5 and its influence on next season’s outcome? Volkswagen has demonstrated that their car will be fast right from the start, and that everyone else will have to take them into account. We shouldn’t forget that we’ve been developing our car since 2015 and we’re trying to make it better all the time. They were fast enough to keep up with us in the first rally and we can expect them to improve still further. The good news is that we still managed to beat them in Spain. 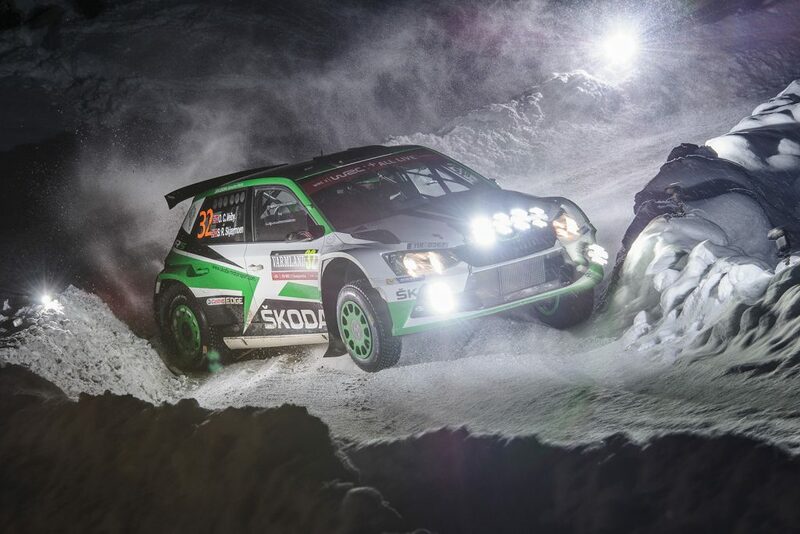 For ŠKODA Motorsport, it’s also great motivation to keep improving. How similar or dissimilar is the Polo R5 to your FABIA R5? Pavel Dresler: There are very few similarities with our car. While Volkswagen uses an almost identical engine for the Polo R5 as the one we have, the rest of the car is completely new, built on the more modern MQB platform. There are a lot of Czech fans going to see you at rallies. Are you even able to notice things like Czech flags, flying around the track at full pace? Pavel Dresler: I can only lift my eyes from time to time, on longer straights or on a hairpin. Otherwise, I barely notice our surroundings. 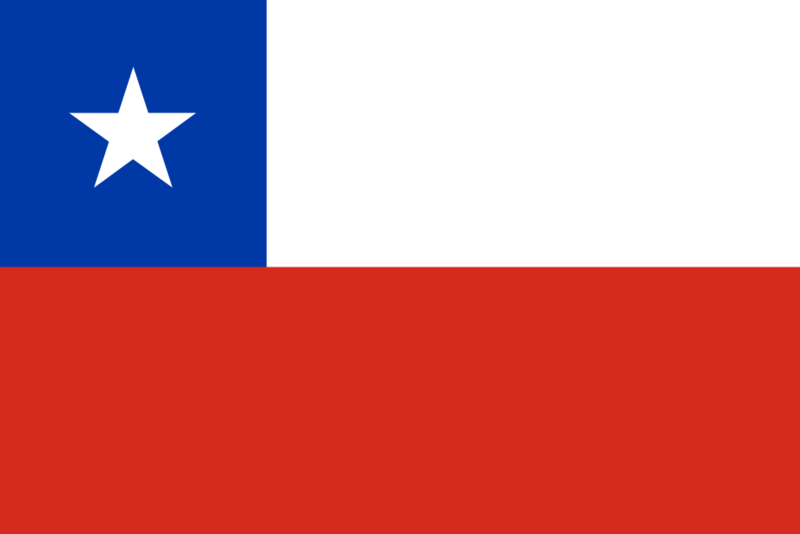 Jan Kopecký: The Czech flag isutterly unique and as Czechs, we, of course, recognize it at a hundred paces. On the walls of the German vineyards, for example, you really couldn’t miss it. Pavel Dresler: Although I can’t see much while driving, I do notice that some fans are really loyal about coming to see us. For example, one group took pictures with us before the shakedown at every rally, and they always came to the prize giving ceremony. Some of them really do go to every single rally and try to follow us right through the season. The season is behind you, what will you do before the next one starts? We’ve now got some free time for relaxation, which is something we don’t have time for at any other time of the year. The off-season is our only chance to do things like going on vacation. During the season, there is no time for anything, so the only time to get away is sometime during winter, maybe in February. Which rivals were hardest to beat this year? We had to beat everyone to win, but of course, beating our teammates Pontus Tidemand and Kalle Rovanperä was hardest. Let’s stick with Kalle for a little while. You’re twice as old as he is. He is 18 and could, theoretically, be your son. How does it feel to race against him? Is he really that fast? He proves his speed with results. He may have only just turned eighteen, but when you talk to him, he makes you feel like you’re in conversation with someone who has the experience of a thirty or thirty-five year old driver. That might be partly because he’s been raised to be a world champion, since he was a little kid. He knows it and at the same time, it’s obvious he really enjoys what he’s doing. Since his childhood, he’s been behind the wheel of a racing car or on a motorbike every single day. Not many people have such a combination of opportunity, determination and talent. I think he may be the only person in the world to have such opportunities and to be able to maximise them. 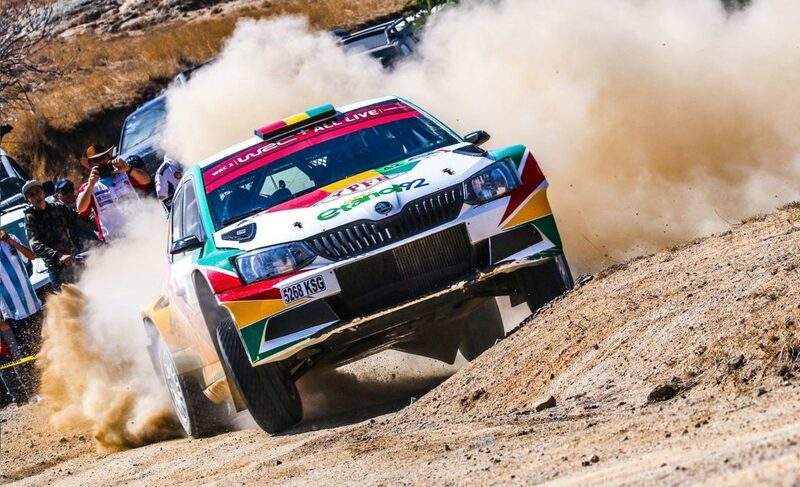 At Rally Turkey Marmaris, it was already obvious that you were in a fight for the title with Pontus Tidemand. You and Pavel emerged victorious. How did it all go down? It was good that we competed against each other in a rally that neither of us knew before. The Turkish rally hasn’t been driven before in this format, so no one from the world’s top drivers was familiar with it. Even though there have been WRC rallies in Turkey before, this one’s returned after many years of absence and in a wholly different location, totally unknown to teams and crews. On the other hand, as we found out during early tests, it wasn’t just about ability in Turkey. It was going to be just as much about luck and about being able to think tactically and avoid problems. The rough, rocky roads meant there was an extreme risk of damaging the car or the tyres. Sometimes, you couldn’t avoid trouble no matter how hard you tried. In the end, that was what decided the result, when Pontus Tidemand had to retire due to punctures. What was your worst moment this season? Was it the moment when you lost the lead in Germany due to a puncture and fell all the way back to ninth place? Probably, yes! What made it even worse was the fact that it happened in the same stage as it did the year before, the Panzerplatte military area, about 5 kilometres further on than last year. It was quite frustrating. Just like in the previous year, we didn’t hit anything as far as we knew, and the tyre was punctured through the thread, not through the sidewall, as if we hit some obstacle. Maybe it was just the Panzerplatte’s infamous rough concrete surface. Let’s not just talk about rallying. Who do you spend more time with? With your girlfriends, or with each other? I’d rather not calculate too closely, but it’s clear that we really do spend a lot of time together. What is your relationship with your teammates? Are you more friends, or rivals? We’re on friendly terms with our teammates. It helps that in rally, you race against the stopwatch, against the conditions and against yourself. It’s not like circuit racing, where there’s a possibility that you could hit each other or send each other off the track. That certainly helps keep relationships friendly. Rally drivers are top athletes and have to keep a healthy lifestyle. Is it possible that after Christmas, you won’t fit in your seat? It’s simple. You just have to lose three kilograms or so before Christmas, so you can gain them back again during the holiday season. If you do it this way, you never have a problem. How old were you when you drove a car for the first time? And we’re not talking about steering on your father’s lap, but really driving? Jan Kopecký: I think I was 11 or 12 years old. Pavel Dresler: Same for me, but in my case it was a farm tractor. We noticed a mobile phone holder in your door. What’s its purpose in a rally car? Pavel Dresler: It’s our only way to communicate with the team. 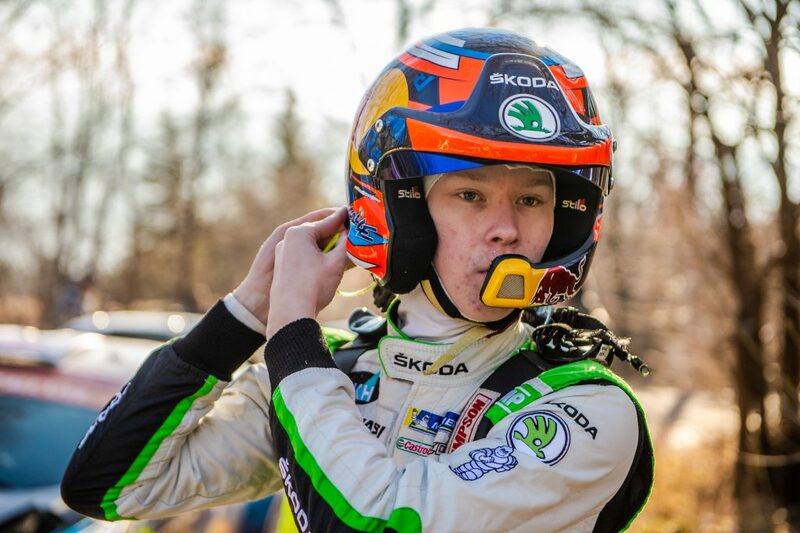 The radios are, due to their cost, only allowed for WRC teams. Without phones, we would be left with carrier pigeons or smoke signals. Still, we’re not allowed to communicate when we’re on the special stage. That goes for WRC teams as well. They can report breakdowns and such, but they can’t share info with their teammates. Do you let your girlfriends drive when you drive your civilian car? Jan Kopecký: Sure, I do. Pavel: Of course, I let her. 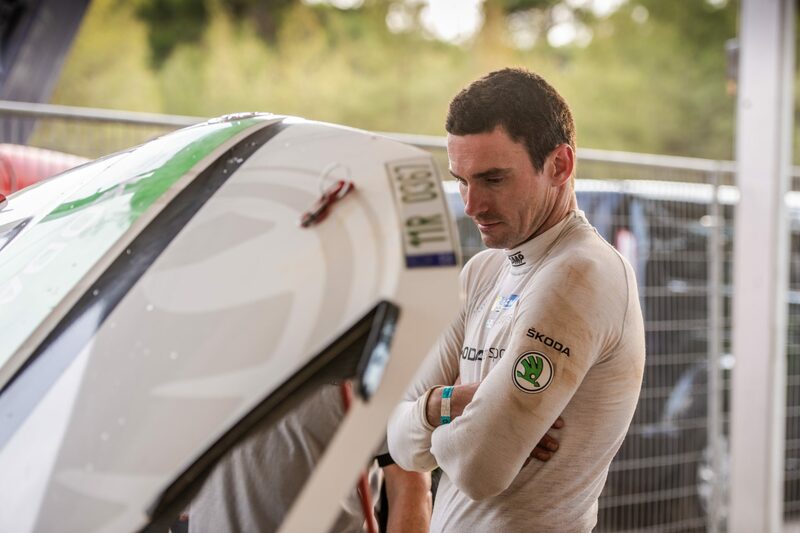 What was the biggest factor this year’s WRC 2 victory? Most of all that ŠKODA Motorsport gave us the opportunity to go after it. It was our pace, our car’s reliability and also luck that decided the final outcome – and, of course, having the works team, with great mechanics and engineers, played a major part in our victory. Do you think that you’ve already earned your luck? Luck comes to those who are prepared. You can’t rely on it, you have to help it along. Sometimes you have more and sometimes you have less – that’s always true! In other seasons, we may have made more mistakes. This year, it really went well for us. Pavel, we heard you’re still in school. What do you study and how does it work alongside a rally career? I’m finishing my PhD in applied mathematics at VSB – Technical University of Ostrava. It’s quite easy to make it work with rallying. I’m an employee of the university and I teach there. It’s handy that we have 40 days of vacation, so I can always make it work somehow. When I have to go to a rally, my colleagues take some of my lectures or classes and then I return the favour when I come back. How long have you been driving together? Since the last rally of 2011, which was Rally Cyprus. We tested together before, though. Pavel, were you ever afraid in a car with Honza? Pavel Dresler: No. Once you start to be afraid in a rally car, you have to quit. It starts to take its toll on your reading of pacenotes and your accuracy. You start to monitor the driver all the time, and you’ll never be good again. You have to have respect, though. Once you lose it, you start to think too much about yourself, you gain too much confidence and start making mistakes. Sometimes I do get startled a bit. When you’re looking down at your pacenotes and realise that something isn’t how it should be, you can get nervous for a while. 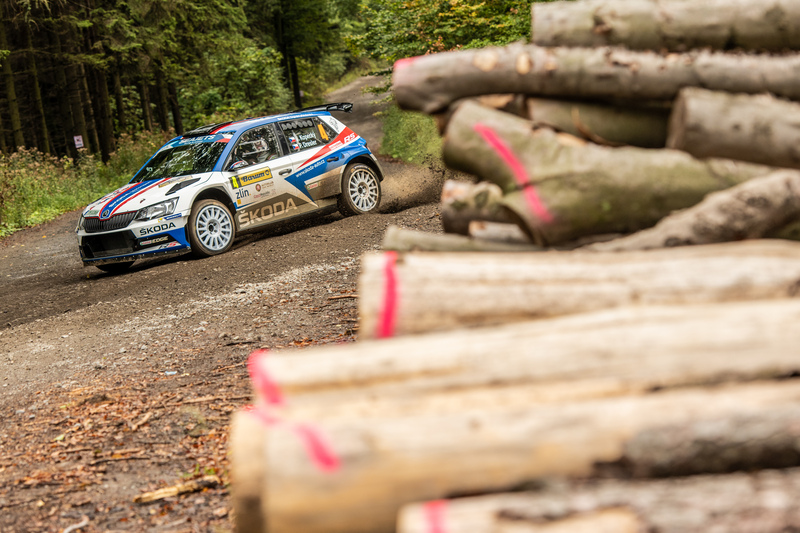 Which rally of this year’s season was hardest for you as co-driver? Pavel Dresler: Toure de Corse, for sure. It’s a real test of your co-driving. The hardest thing about it is the way the rhythm changes. At one moment, you are going through a quick series of bends, where you can’t even lift your eyes from the pacenotes, and suddenly, you’re in the sweeping section, where you need to read more slowly. You can’t give the information too early, as the corners on Corsica are all alike and once you get lost, you’ll never get a chance to “find yourself” again. Some sections are up to 15 kilometres long, with almost identical curves. Honza, could you drive blind with Pavel navigating? Jan Kopecký: I think so. Until the first corner. Then I would crash. 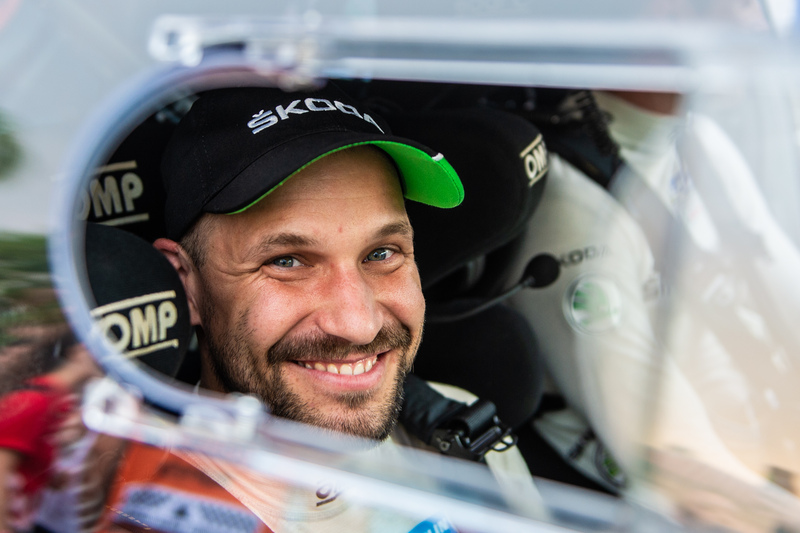 Pavel, do you ever drive FABIA R5? 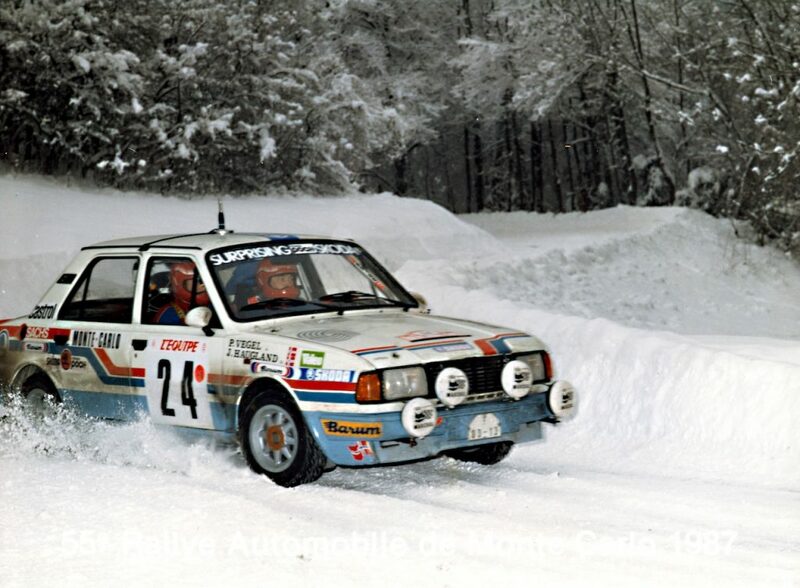 Some co-drivers are also capable drivers, what about you? Not at all. I can’t reach the pedals. As you know, the FABIA R5 has fixed seats and our difference in height is so great that to drive his car, I would have to have twenty-centimetre heels, or else sit in such a way that I wouldn’t be able to see out. I’m able to drive a car on the transport stages, but I wouldn’t be able to drive a special stage at full pace. Pavel, have you ever thought about being a driver rather than co-driver? Pavel Dresler Never. I would rather be a great co-driver than mediocre driver. Jan Kopecký: He’s good at driving, but not that good! (laughter). Pavel Dresler: Sometimes I beat him at go-karts, though! Jan Kopecký: That’s because you’re so much smaller and lighter! Pavel, is there a trick to being able to read while riding in a car and not becoming sick? I don’t think so. You have to be born with it, you can’t learn it. Let’s imagine that the FABIA R5 has a radio and you could listen to it during a rally. What would you play? We actually play Spotify through our headphones during the transport stages. Usually, it’s some classical rock – AC/DC, Iron Maiden and such. Do you or did you play racing videogames? Jan Kopecký: Yes, when I was a kid. 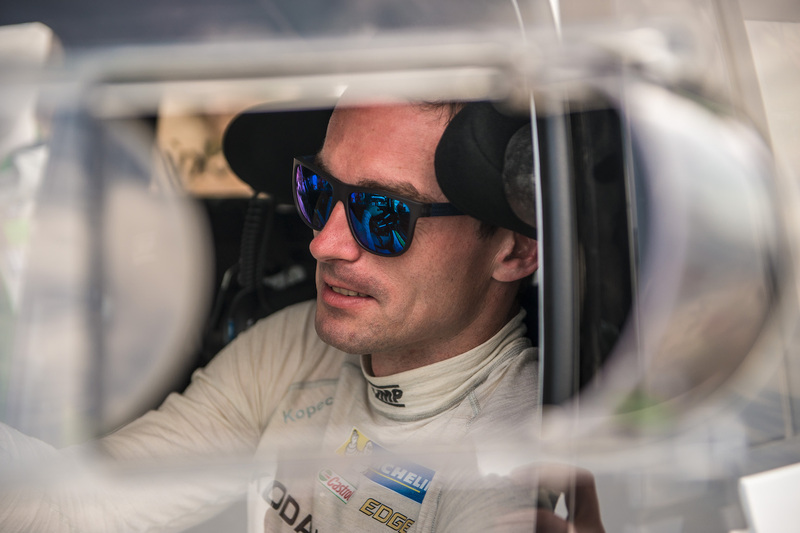 Pavel Dresler: Me too, I used to play Richard Burns Rally on quite a high level. Games are different to actually being on the track, because you have the same conditions all the time. In reality, even if you repeat the same rally stage year after year, the conditions are always totally different due to weather or starting order. Pavel Dresler: Maybe for a total novice, it might help to develop the right reactions, but it’s a long way from reality. How will you reward yourself for your victory? Winning in Turkey, we also won a trip on a yacht for ten people or so. We’ll try to make use of it with our friends.